Zampa di Gallina (‘chicken feet’) is a menswear site set up recently specialising in Neapolitan makers. At least one of them has a connection to Naples, so it’s nice to have slightly more local retail, particularly for those of us buying in Europe. The brands on offer range considerably in price and make, and are something of a mixed bag. The most eye-catching is the ready-to-wear shirts from Anna Matuozzo (above). A well-known bespoke shirtmaker who has previously eschewed RTW, Anna is now offering these shirts to the same quality as bespoke, except of course for the bespoke fit. Each is made to order, and takes around a month to make. The level of work is very good: all the functional handwork you’d expect (hand-attached collars, sleeves etc) plus showy details like pick stitching around the collar band and shoulder seams. However, other work you might expect for the price (€280) is missing, such as a hand-worked side seam and bottom edge. It is of course also RTW, so no bespoke fit. 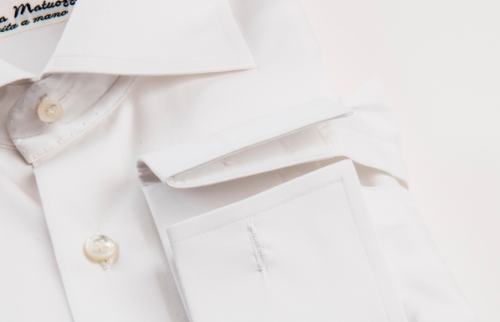 There are also two cheaper lines of RTW shirts, Sentiero and Avino, with just the functional handwork. (Confusingly, Avino is different from my bespoke maker, D’Avino.) Avino also does different levels of make, and this is the lower end – as you’d expect for €140. Some, such as those stocked at Brio in Beijing, are a magnificent make, with more of those hand details than Matuozzo. The ties are EG Cappelli and Calabrese. I like Cappelli ties, even if they do have a tendency to be over-pressed. It is also a shame that the seven-fold construction, though nicely done, does not extend all the way up the tie. It is the way most seven folds are done, with only three folds above the keeper, but I prefer a true seven fold in that respect. Thick in the knot, flyaway in the blades. There are Talarico umbrellas, which we all know, and the Omega gloves are nicely made. 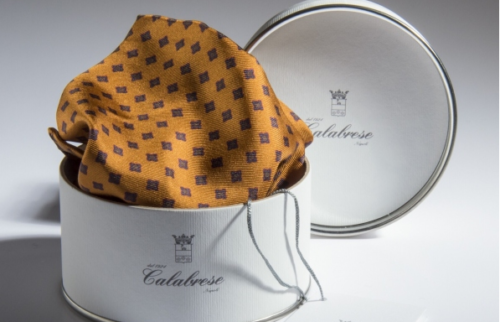 I can’t recommend the Calabrese handkerchiefs (below) from what I’ve seen, however. Most are digitally printed and as a result don’t have enough penetration of the silk; they are also too small for a silk or silk/wool hank (33cm). I don’t often do breakdowns of online stores, but hopefully this is a useful guide to a new entrant. You can follow the discussion on Zampa di Gallina: Neapolitan retail by entering your email address in the box below. You will then receive an email every time a new comment is added. These will also contain a link to a page where you can stop the alerts, and remove all of your related data from the site. Good article. I have been aware of this site for just over a month or so now and perused all the items listed here but the way you describe though, the depth of thought – well, it shows you are a writer and i am not. 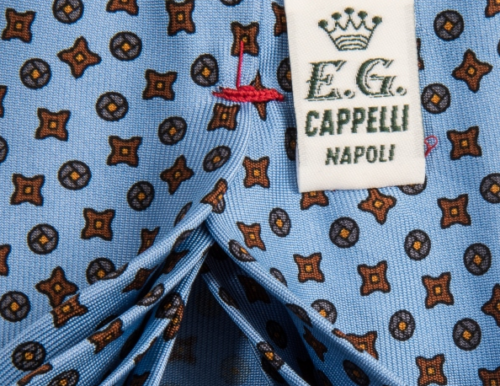 What do you mean when you refer to Cappelli’s ties as ‘over-pressed’? I love Drakes but Cappelli has been my preferred go-to-tie maker for a while now. 1. Great post – and really interesting. What do the ties retail for? 2. Equally I’ve been meaning to ask you. As a fellow cyclist I’m looking to upgrade everything to Merino. Other than Rapha what other clothing brands/items do you recommend. 3. I know you’ve recommend cutler and gross. What glasses do you recommend for cycling? Thanks again for a great blog! I have a couple of cycle jerseys from http://www.torm.cc/products.html I rated them highly. Well thought throw and executed designs, pleasant colours, made out of sports wool. All at a fraction of Rapha prices. They are good with returns so it’s easy to size up or down to get the desired fit. The only note of caution is that their base layers are also made out of sports wool, were as I much prefer pure merino for base layers. Thanks Sam. I agree on the merino base layers, and I have tried the Torm jerseys. They are great value for money although I’d still say some way off Rapha in terms of quality. Also surprised they haven’t been sued for so blatantly copying the Rapha designs! What a beautiful and informative article!!! Interesting comment on the penetration of the silk regarding the Calabrese handkerchiefs. In your experience, is this an issue with all scarfs/handkerchiefs that are digitally printed? Do you know if Drake’s digitally print any of their products? Usually only with the cheaper makers. Drakes screen print almost everything – they only digitally print occasionally on summer patterns where penetration isn’t necessarily an issue. It will be interesting to see how many of the high-end makers take up digital printing in the future as the technology improves. The benefits in terms of production efficiency and resource intensity, not to mention environmental impact, are surely too great to ignore.